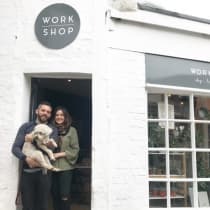 Venture down one of Shrewsbury's many cobbled side streets and you'll find Workshop, a curated homewares boutique in one of the oldest buildings in town. Founded by Penny Amey and Nathan Cavin, the shop is brimming with beautiful interiors and lifestyle items, from plants and pots to artwork and accessories. The boutique's name comes from the fact that Penny and Nathan regularly hold creative workshops in the space, including macrame, arm knitting, and brush lettering. "In a time when almost everything is instant, I think there's something hugely endearing about taking your time and browsing a selection of beautifully curated pieces. I think it's time for the independents to shine and offer something that no algorithm can match."